TEASE ME: Darkened front end of the final Aussie-built Commodore - the VFII - has been released by Holden ahead of its full reveal this Sunday. 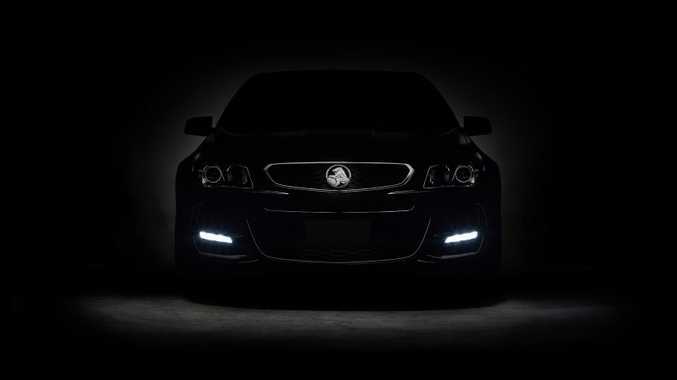 A TEASER photo has been released by Holden ahead of the reveal of its Commodore VFII this Sunday (September 13). It will be the last ever Australian-built version of the Commodore after 37 years of Holden service, with Holden claiming it will also be the greatest Commodore ever built. Over 8000 fans have already registered to watch the new car's reveal live online at 10am this Sunday, and the dark image released is the first of numerous teasers coming over the next two days. From tonight Holden will release two Commodore VFII teaser videos on Facebook and Twitter, hinting at what's to come. Little can be seen in this first image, except hints of updated headlights, new front bumper and larger bonnet bulge over the current model VF, which was introduced in 2013. This final version of the South Australian built Commodore - first released in Australia in 1978 with the VB Commodore - will be the last made here before production ends at the end of 2017.